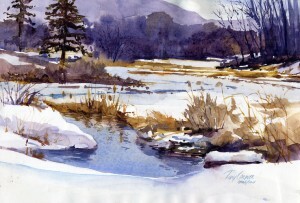 “Winter Pond” – painting is approx. 7 1/12″ x 11″, matted and mounted to 11″ x 14″ for easy, low-cost framing. It’s a wonder that there is still any moving water around. Arctic air set in early this year and the mercury has been below freezing and hovering closer to zero most of the time since December. This little pool of water was all that could be seen of Miller’s Pond. The rest was is covered with a layer of snow over what must be very thick ice at this stage. A few straggles of left over brush and stalks poke out of the snow. Mostly, the pond looks like a large flat field or even a snow covered parking lot. The sight of moving, reflective water was stunning – it had to be painted!